1.The GOVERNMENT OF MONGOLIA has received financing from the World Bank toward the cost of the Smart Government Project, and intends to apply part of the proceeds toward payments under the contract for Supply and Installation of Goods for National Disaster Recovery Datacenter. 2. 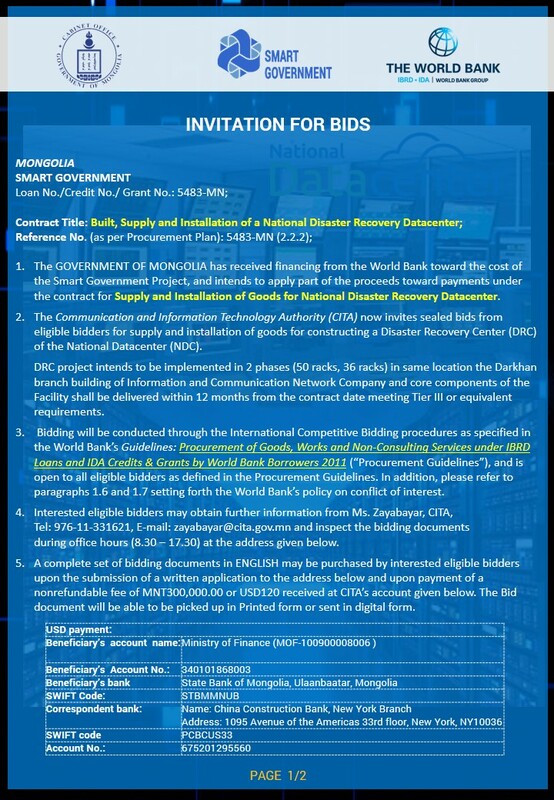 The Communication and Information Technology Authority (CITA) now invites sealed bids from eligible bidders for supply and installation of goods for constructing a Disaster Recovery Center (DRC) of the National Datacenter (NDC). 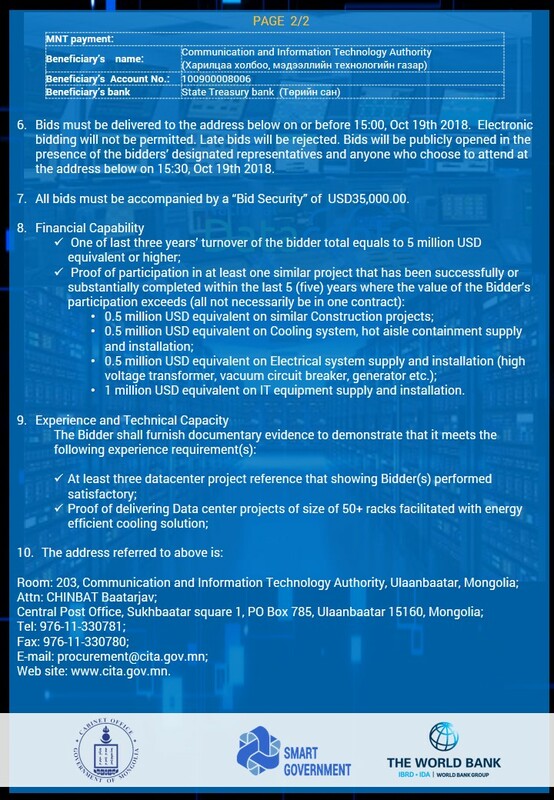 DRC project intends to be implemented in 2 phases (50 racks, 36 racks) in same location the Darkhan branch building of Information and Communication Network Company and core components of the Facility shall be delivered within 12 months from the contract date meeting Tier III or equivalent requirements. 3. Bidding will be conducted through the International Competitive Bidding procedures as specified in the World Bank’s Guidelines: Procurement of Goods, Works and Non-Consulting Services under IBRD Loans and IDA Credits & Grants by World Bank Borrowers 2011 (“Procurement Guidelines”), and is open to all eligible bidders as defined in the Procurement Guidelines. In addition, please refer to paragraphs 1.6 and 1.7 setting forth the World Bank’s policy on conflict of interest. 4. Interested eligible bidders may obtain further information from Ms. Zayabayar, CITA, Tel: 976-11-331621, E-mail: zayabayar@cita.gov.mn and inspect the bidding documents during office hours (8.30 – 17.30) at the address given below. 5. A complete set of bidding documents in ENGLISH may be purchased by interested eligible bidders upon the submission of a written application to the address below and upon payment of a nonrefundable fee of MNT300,000.00 or USD120 received at CITA’s account given below. The Bid document will be able to be picked up in Printed form or sent in digital form. 6. Bids must be delivered to the address below on or before 15:00, Oct 19th 2018. Electronic bidding will not be permitted. Late bids will be rejected. Bids will be publicly opened in the presence of the bidders’ designated representatives and anyone who choose to attend at the address below on 15:30, Oct 19th 2018. 7. All bids must be accompanied by a “Bid Security” of USD35,000.00.